Kourtney Kardashian & Scott Disick Hang Out Poolside with Their Kids in Miami! Home » Kourtney Kardashian & Scott Disick Hang Out Poolside with Their Kids in Miami! Kourtney Kardashian and partner Scott Disick were spotted enjoying a sunny day by the pool at the Setai Hotel in Miami with their kids Mason and Penelope on Saturday. Kourtney looked gorgeous in a yellow one-piece bathing suit while cooling off in the pool with her little lady. Afterwards the reality star nursed the toddler in a lounger while she chatted with friend Larsa Pippen. Scott played in the pool with Mason and also floated around with Penelope. With a nanny along for the trip it is likely that Scott and Kourtney were able to have a date night in the sunshine state. 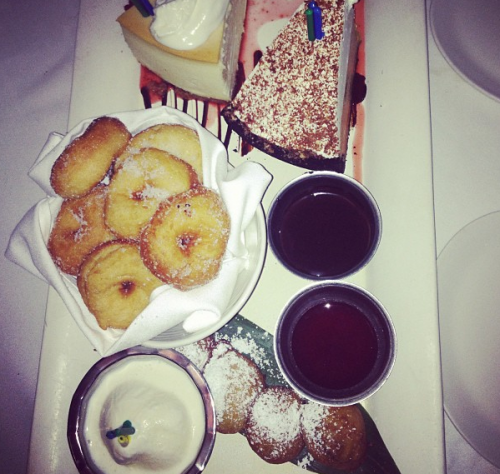 Kourtney tweeted a picture of dessert from last night, which supports my theory! Jennifer Garner Shops With Her Crew!